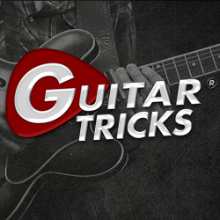 The Ultimate Guitar Tricks Review for 2015 - Does It Work? How Well Does It Help You Learn To Play? This is a self-study tutorial, and can be done faster or slower as you prefer. 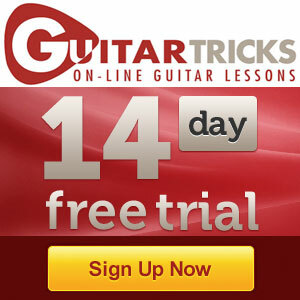 Try Guitar Tricks Absolutely FREE for 14 Days! Not just a lesson set – an entire system w/ forum, jam tracks, games + more. Nothing I could find that tied in singing and playing guitar together. Learn to Play The Guitar Like a Pro Risk Free! This is my personal Guitar Tricks review. I’ve gone through the core of the program, but let’s be real – it will take a good year to get through all the lessons in full, not to mention all the ones they keep adding. But that right there says it all – this is the most comprehensive training program available, and I think it’s a great option for both beginners and experienced players. I will keep updating this review with more information as I finish the course. If you’ve read my other reviews then you know that I’ve always loved music. And when my parents bought me my first guitar at 10 years old, I thought I’d be a rock star. And I hated them – they were dry, boring and worst of all I didn’t get to learn the type of music I wanted to play. So I gave up. But that wouldn’t be the end. When I first learned to sing, I used online singing lessons and they worked great. So why not try the same thing with this, right? When I first logged into the program after signing up I was overwhelmed, yet again. The amount of stuff to learn can be seriously staggering. Most people confronted with that much info will think “where do I even start?” But luckily they have a structure that makes sense. When I saw the videos at first I was afraid they’d be boring. But I was relieved after the intro video – because it explained how everything would work… And so I knew that I’d be learning the type of music I wanted really soon. I was itching to learn some Jimi Hendrix and BB King. But there was so much more than just that. In fact, I would first do a fundamentals/theory lesson, and then practice a bit. But then I’d go check out a song lesson and just watch and try whatever I could. And that kept me motivated and actually really excited to keep up with the daily lessons and practice. I needed to keep getting better. I started knowing very little, and now I can actually play properly. I was excited taking this program so I went through the core system pretty quickly and practiced a heck of a lot each day. And I’ve made some SERIOUS strides. I come up with melodies and chord progressions all the time just for fun now. I read tabs and love to learn songs too. I will update this review with my progress as I go through everything, and move onto different videos and styles/songs. I’m also using Jamplay which is a great tutorial site. Check out our full JamPlay review. This is a pretty amazing platform to learn to play and I highly recommend it to anyone that wants to learn to play online. I’ve only been at it for a few weeks and I’ve already seen crazy improvements. If you want to learn how to play guitar in a way that’s actually interesting and excited, try it out. There’s a 60 day money back guarantee. So you have 2 months to try and learn and if you don’t, you can get your money back. Easiest decision I ever made. And I actually ended up learning a lot and becoming a much better player! These lessons are based around the exclusive “Core Learning System” – a structured set of over 1500 that begin at the very basic (ex/ how to hold a pic) and progress to more intermediate topics. 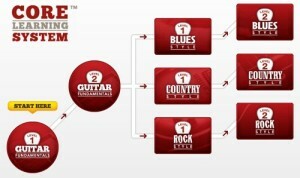 You can follow along with this overview with their 14 day free trial and free guitar lessons. Your first thought is to play the video in the center. But that’s just a random lesson. You want to choose the Core Learning System graphic on the left sidebar in the above pic. This takes you to the beginner lessons which have 3 separate sections. It’s a good idea for all beginners to start here before diving into the songs/styles. Even if you decide to jump back and forth between the fundamentals and the styles/songs, don’t skip this stuff if you’re just starting out like I was. The great thing about the core system is you hit the ground running right after learning your fundamentals. So you could speed through the fundamentals, learn them and go straight to playing your favorite styles. You can learn a lot of different styles with the program, but in the core training you focus on 3 to become well rounded – blues, country and rock. Of course, you don’t have to go through all of them if you don’t want, but its a good idea to. 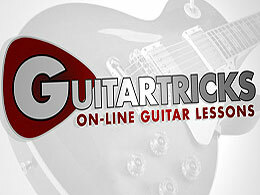 Now, there are over 8000 lessons included in Guitar Tricks so there’s no way we could review it all right here. Just know that this course will have you busy for a while! You should be able to get through the core learning system in two months (enough to evaluate fully before the money back guarantee expires). and SO MANY MORE. There’s a ton of different artists included and this is definitely my favorites part of the entire course. This section is 20 different techniques that are the top videos to get you playing like a pro once you’ve mastered the fundamentals. In these lessons you’ll delve deeper into studying the particular styles of guitar greats throughout history. From BB King to AC/DC there’s something for everyone. In this additional module you’ll delve deeper into these three important areas of playing the guitar. All about crafting your signature tone. Every great player has a particular tone they love. What will yours be? There’s also a forum and jam sections on the website. I haven’t fully explored these two areas yet because I’m having so much fun. But I will check them out and report back on this review when I get the chance. But even without the forum and jam session (and the practice games) this online lesson is well worth the price. At $14.95, you can’t really lose here. You’re bound to learn the instrument with Guitar Tricks. But what’s best is the way you learn. Through awesome videos and your favorite popular songs. You’ll learn everything you need to know and not even realize it’s a tutorial. This is a great program that’s easy to use, easy to understand and get the hang of and it’s got the most amount of material. That means there’s bound to be something in there you’re going to love. If you dont, you can always get your money back within the first 60 days. And 60 days is a long time to try any program. I learned a lot, and if you’re trying to learn how to play the guitar (at any skill level), you will to.